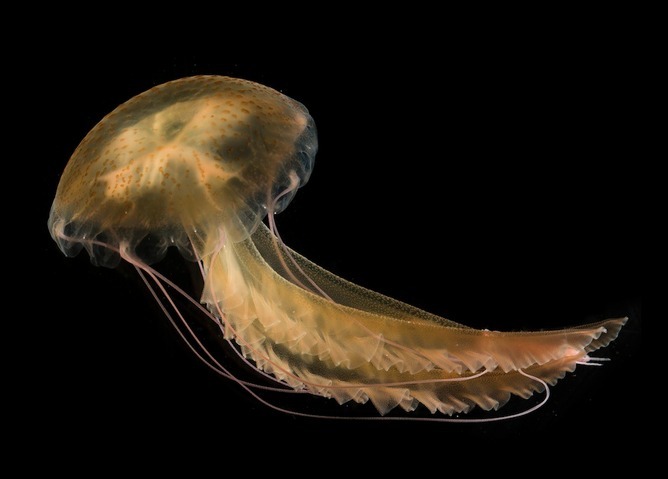 Mauve stingers jellies can appear on coast by the thousands, literally overnight. This may come as no surprise to salmon farms off Ireland, or tourists in France and Spain. But where do these mauve stingers coming from? How can thousands of animals just show up, as if out of no where? Mauve stingers are an anomaly among jellyfish. And its strangeness also makes it difficult to track them. Most jellyfish break their lives into two parts: a larval and adult phase. First comes the bread-crumb sized larva, called a polyp, which lives on the seafloor. When conditions are right the polyp undergoes metamorphosis into a stack of tiny jellyfish, which grow into larger, more familiar adult jellyfish. But that is not mauve stinger’s story. It grows from an embryo directly into a tiny jellyfish, skipping the polyp stage. Without being tied down by a polyp, it is free to roam the world’s oceans, like a butterfly that never has to touch the ground. This nomadic life makes the arrival of the mauve stinger difficult to predict. Only last year it was discovered that mauve stingers live year-round in the Mediterranean sea, and that summer swarms in Italy, France and Spain may be due to changes in ocean currents and wind patterns, rather than jellyfish numbers. This makes long-term sense. In the Mediterranean, the occurrence of the mauve stinger has been recorded for over 200 years. With these data scientists have discovered that the arrival of mauve stingers can be predicted, at least in the Mediterranean. Warm, dry summers increase the chances of beach encounters with the mauve stinger along the Riviera. Could these same patterns of increase and decline also occur in other parts of the world? Absolutely. Tom Doyle, the head of the Big Jellyfish Hunt, has said the jellyfish were abundant for yeras after 2007. The Big Jellyfish Hunt is a collaborative effort to track jellyfish in the Irish sea using citizen reports. “After the 2007 bloom, the mauve stinger then disappeared for several years,” he told me. “2013 is the first year that they have been around in abundance.” These observations hint at larger trends, but scientists aren’t yet sure. Until Doyle and colleagues have collected enough information to begin making predictions, researchers are experimenting with other methods for protecting businesses and beaches from the mauve stinger’s impact. Unlike recently unveiledrobot-aided jellyfish killing machines, which shred jellies by the thousands, they are trying less invasive techniques. These include improved salmon pen designs and bubble curtains, which create a constant stream of bubbles around pens, preventing jellyfish from passing through. But for these strange and beautiful creatures, the big questions still remain largely unanswered. Are there always giant purple mats of this jellyfish, stretching for miles in the open ocean? And would that really be so bad? These ethereal jellies likely play an important role in the health of ecosystems, including as food for animals like loggerhead sea turtles and bluefin tuna. With their vivid color and bright bioluminescence, if they are out there somewhere, that is something I would like to see. I have a question. I walk the beach everyday, Grant Ave, Cocoa Beach, FL south one mile. Often there will be moon jellies washed ashore. An average day, 2 or 3. A few weeks ago the number increased for a few days, and yesterday there were none. But today, without stopping, without waiting for the waves to recede and reveal any more, I counted 547 jellies on my one mile walk south. 547! Most were the typical 4 petal ( gonad) type, there were about a half dozen 5 petal, and one 2 petal. None were damaged. Most looked a little less pink than usual, but it was a gloomy day, so the light was a little unusual. Nonetheless, the number was very surprising. What is the reason for so many at once? If you have time for an answer, I would most appreciate your response. A new species of jellyfish, possibly Pelagia Noctiluca, has recently been found in the Gippsland Lakes in south-eastern Australia – see link below. Some folk seem to be describing them as pests and developing all sorts of theories about why they are here (along with a large population of Blue Blubbers that come and go over the years). My explanation would be a warm dry summer that has raised salinity levels in the Lakes (a coastal estuary fed by fresh water from rivers and the saline water from the sea). We also have a relatively high volume of algae, zooplankton, etc.fed by high nutrient inflows over the past three years. I think this is what washed up on the shore here in new zealand. I have a photo of it. Apprently been all over auckland beach raglan as well. I have photos if you want to confirm for me. Sure I’d love to see! My email is in the “About” section. Stay safe! How does it finds it mate and is is asexual or sexual? They reproduce sexually. And for your second question–I’m not sure! But they do tend to bloom in groups.